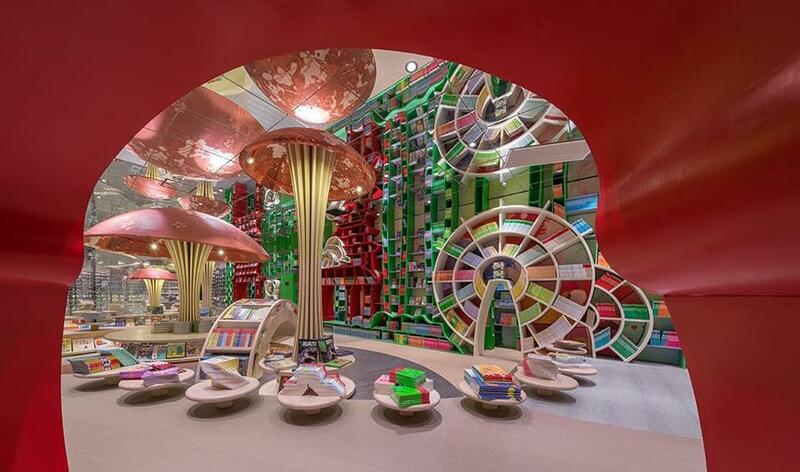 Odd as it may seem, we believe that bookstores are coming back. Yes, books are one of the easiest items to buy online and various reading devices have made printed books just one option. Yes, bookstores have been amazoned and tableted, but we are also craving for real-life experiences when we shop for just about anything. If we are going to go out to actually shop, we want it to be a wonderful experience. Perhaps, indeed, the demise of the bookstore with the coffee shops, reading nooks, author events and knowledgeable staff was only temporary and the shrine for all things book and reading is coming back? We think – and hope – so. Bookstore owner and book publisher Jin Hao in Shanghai has persistently believed in bookstores in China for more than two decades since he quit his teaching job and opened his first bookshop. By 2010, his chain had grown to 21 stores but struggled under the fierce competition from online stores and digital publishing. 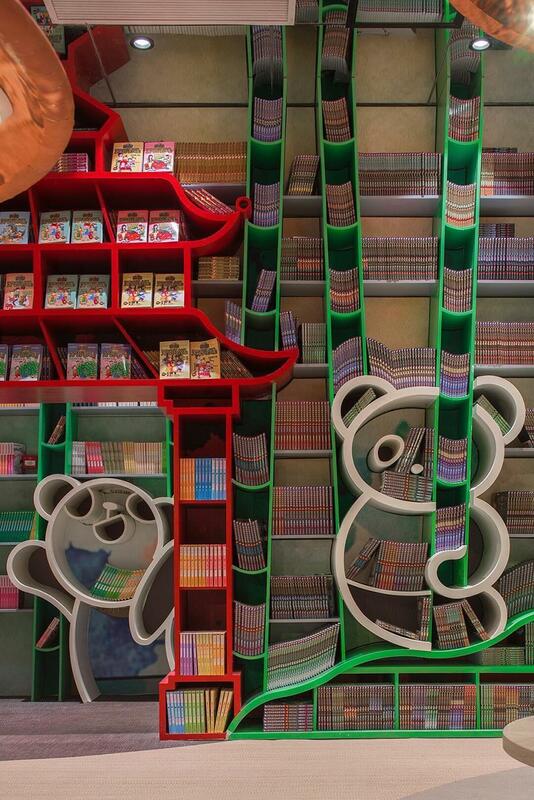 He went back to the drawing board and invited Shanghai-based designer Li Xiang of XL-Muse to help him reimagine the book buying experience. 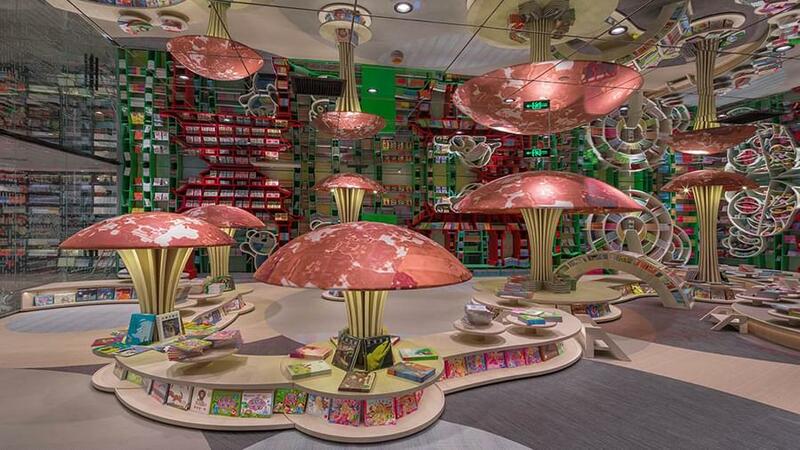 The first three Zhongshuge bookstores opened in Shanghai, each with its own style and character. 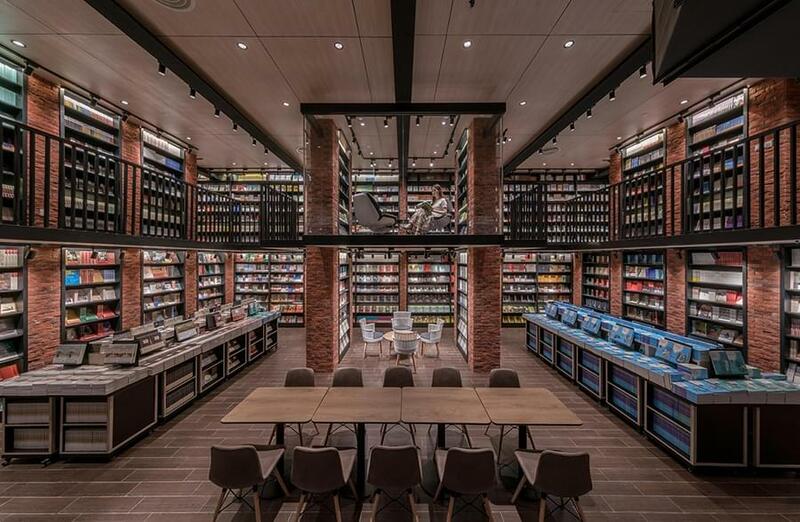 The next step was the 10,000 square-foot (930 Square metres) store in a busy shopping mall in Hangzhou. 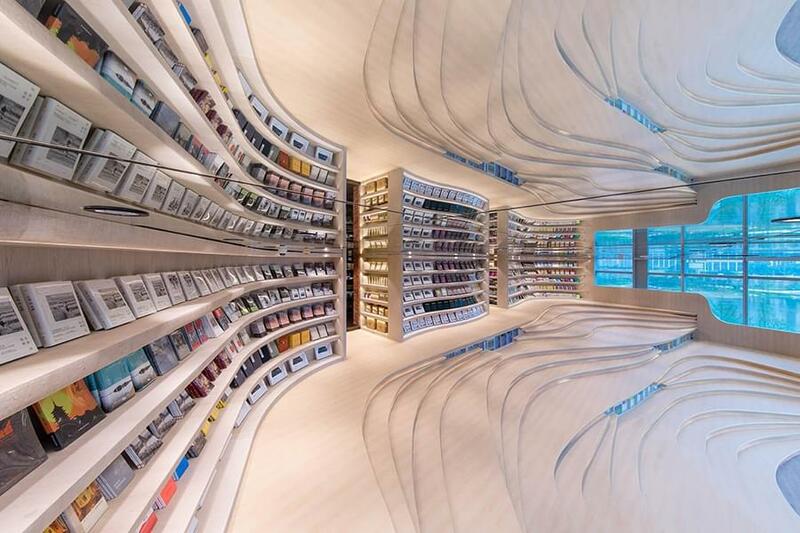 It started showing the distinctive characteristics of a Zhongshuge concept store: Vast spaces, mirrored ceilings, whimsical shelving, nature-inspired quirkiness. A space to hang out, to hear writers’ lectures, to read and, of course, buy books. 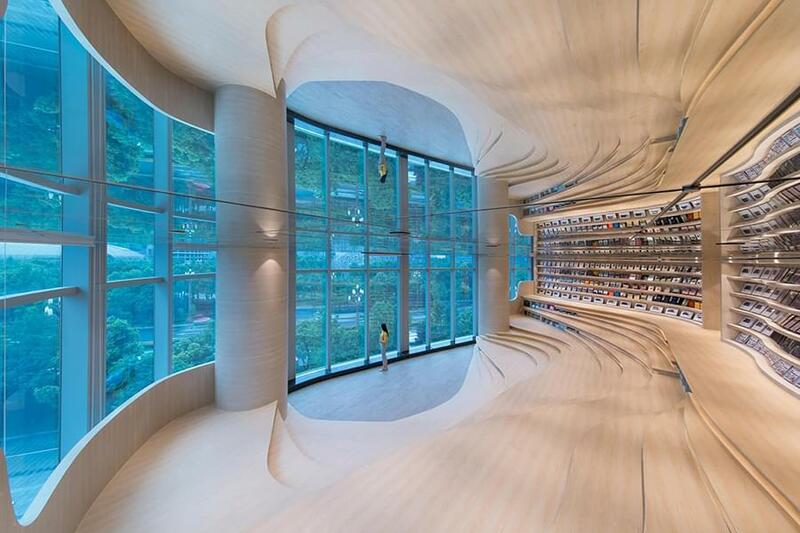 The latest Zhongshuge bookstore store cooperation of Jin Hao and Li Xiang is the massive Chengdu book emporium located on the fourth floor of the Yintai Centre shopping mall. 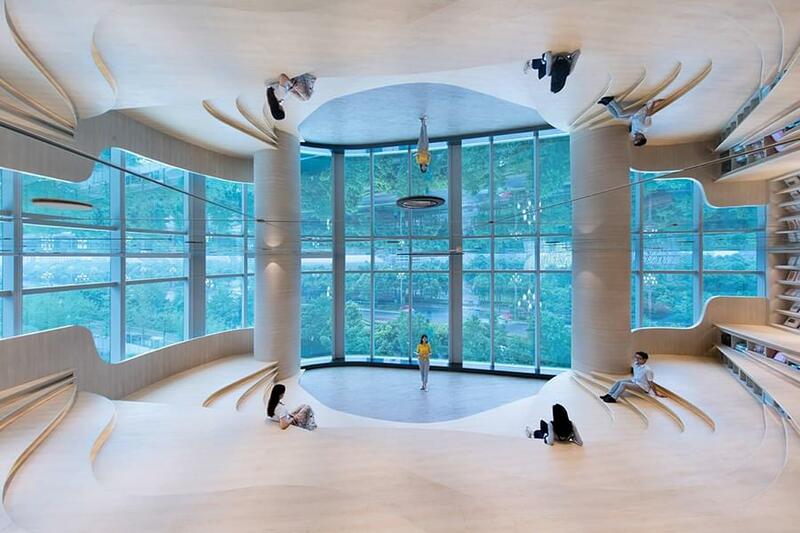 In this store, both the lecture hall and the children’s area have mirrored ceilings that help the spaces look much larger and also create a slightly mad upside-down experience. 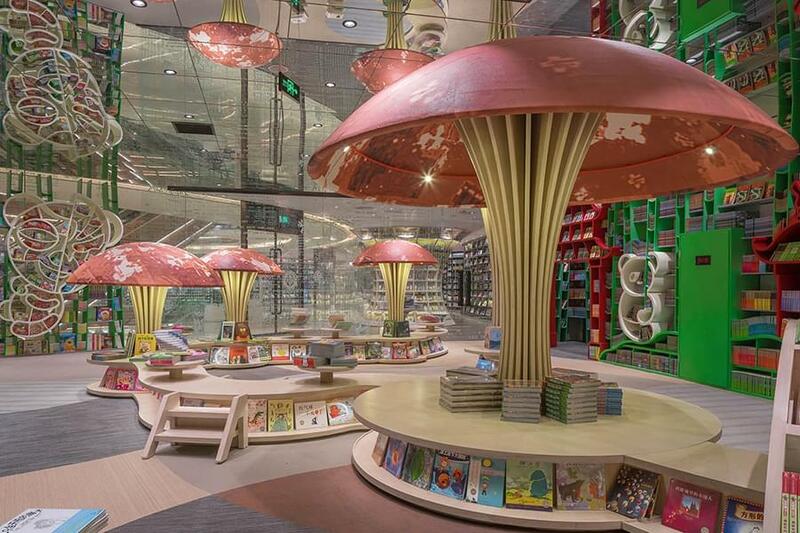 Massive mushrooms, shelving in the shape of pandas and bamboo forests, and the overall feel of a jungle create an impressive backdrop for what the owner and designer hope to be an expression of the magic of books and of their power to change our lives.